As a veterinarian focusing on end-of-life care, I am often asked, “How do you do this?” Quite simply, the answer is because I care and I am proud to be able to help animals by relieving suffering and comforting their families. I’ve had to go through this myself for my own pets. I’ve also seen what pets and people go through in the hospital setting and what it takes to bring in a sick and frightened pet. I get it. As if the grief wasn’t enough, I’ve seen in the owners’ eyes the fear, the worry, and the wish for privacy and to not be rushed. I don’t just provide pet euthanasia at home; I make every effort to make a family’s most difficult time as peaceful and relaxing as can be – for both the pet and their people. I do my best to take care of everything and do it so well that the family will not worry about their pet being in any pain or fear, and can just focus on their bond with their pet. Everyone has been so grateful to me for providing this option and being gentle and caring with their pet so they can part without fear and surrounded by their loved ones. The relief and gratitude in their eyes after I give them the help they need keeps me going. Throughout my website, you’ll see photos of pets I’ve had the privilege of having in my life. They remind me constantly of the level of care and compassion I know every pet deserves. 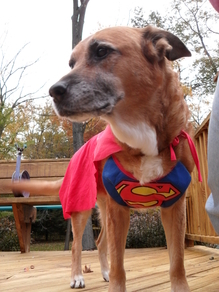 Tucker in her appropriate costume because she was “super”. She was a great buddy and always up for anything. She used to love to ride in the car. But as she aged, she became weaker and her reaction time slowed so she couldn’t handle the turns and bumps anymore. She would fall, it probably hurt, and she became very anxious about going in the car. What was once her favorite thing had become a source of fear, discomfort and anxiety. She was the first pet of my own that I spared that trip to the hospital for euthanasia and the one I think about every day.